"This is the stuff that cake dreams are made of... for those homebakers who love tinkering with tricky batters and pulling out the pastry bags" (Kitchn). 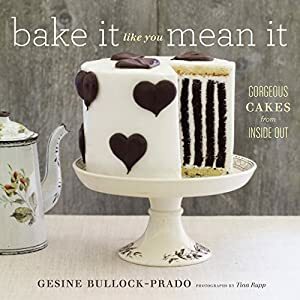 Gesine Bullock-Prado says it's what's inside that really counts, and in this visually sumptuous book, the author of Sugar Baby and Pie It Forward showcases cakes that are beautiful from the inside out. Each chapter is devoted to a technique of making different types of cake, beginning with the easiest recipe and moving to more technically difficult as the chapters progress. When the cakes are cut, they will reveal intricate layers of patterns and designs -- such as hearts, checkerboards, helixes, and colorful stripes -- that will bring a smile to everyone who enjoys them. This compendium of gorgeous cake recipes and techniques will yield glorious meringues, sponge cakes, pound cakes, cheesecakes, and tarts for all levels of bakers. With her trademark wit and enthusiasm for the world of confections and baking, Bullock-Prado's latest book will delight her fans. Log In to track Gesine Bullock-Prado on eReaderIQ. to be notified each time the price drops on any book by Gesine Bullock-Prado. to stop tracking Gesine Bullock-Prado. Log In to track Tina Rupp on eReaderIQ. to be notified each time the price drops on any book by Tina Rupp. to stop tracking Tina Rupp. We started tracking this book on March 11, 2013. The price of this book has changed 92 times in the past 2,232 days. The current price of this book is $14.49 last checked one day ago. This lowest price this book has been offered at in the past 90 days is $2.99. The lowest price to date was $1.99 last reached on March 13, 2018. The highest price to date was $23.00 last reached on May 8, 2018. This book has been $23.00 one time since we started tracking it. We last verified the price of this book about one day ago. At that time, the price was $14.49. This price is subject to change. The price displayed on the Amazon.com website at the time of purchase is the price you will pay for this book. Please confirm the price before making any purchases.